Along with the Boston Marathon and a home Red Sox game, today Massachusetts observes Patriots’ Day. This holiday, the third Monday in April since 1969, commemorates the Battle of Lexington on 19 April 1775. In Lexington, the reenactment of the battle begins in the early morning hours as the Regulars – the British soldiers – march toward the town’s Common, and the militia company exits the adjacent Buckman’s Tavern to gather on the Common, now known as Battle Green. 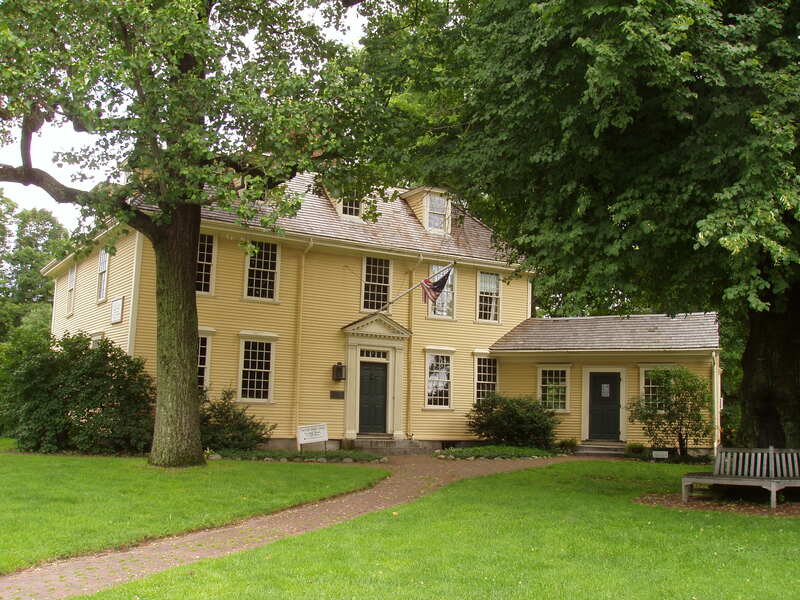 Buckman’s Tavern, the first public house in Lexington, was also a headquarters for the militia and a meeting place for the local training band under Capt. John Parker. At that time, John Buckman was the owner of the tavern. However, it was Benjamin Muzzy (1657–1732) who built the house. Benjamin, born in Malden, was a large land owner in the center of town and one of the largest taxpayers in 1693. That year, on 20 October, he bought land from Edward Pelham. According to the deed, Edward Pelham of Newport, Colony of Rhode Island, merchant, for one hundred pounds, sold a parcel of lands amounting to about two hundred and six acres to Benjamin Muzzey, farmer. In a later deed, dated 14 June 1711, Benjamin Muzzy, along with his sons John and Richard, sold about two acres of land for about sixteen pounds to the “Inhabitants of Lexington,” by subscription, for a common, and an eventual site for a meeting house. Benjamin Muzzy’s probate record (he died intestate) included an inventory taken on 16 June 1732; it listed a mansion house, barn, outhouse, cider mill and press, with about one hundred and eleven acres of orchard, meadows, and upland. John Buckman Jr. (1745–1792) was married first to Ruth Stone, daughter of Samuel and Jane (Muzzy) Stone. Jane Muzzy was the daughter of John Muzzy and granddaughter of Benjamin. John Buckman resided in the house and kept it a public house. It was also a store and later the town’s first post office. 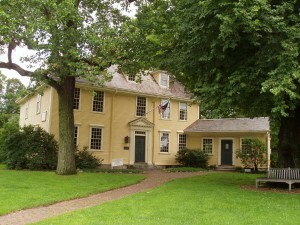 Today the house is owned by the Lexington Historical Society, and is a National Historic Landmark. Massachusetts Vital Records to 1850 (Online Database: AmericanAncestors.org, New England Historic Genealogical Society, 2001-16). Charles Hudson, History of the Town of Lexington, Middlesex County, Massachusetts; from its First Settlement to 1868, 2 vols. (Boston: Houghton Mifflin, 1913). Massachusetts Land Records, 1620-1986, viewed on Family Search. Middlesex County, MA: Probate File Papers, 1648-1871, viewed on AmericanAncestors.org. “Massachusetts Land Records, 1620-1986,” images, FamilySearch, Middlesex > Deeds 1684-1693 vol 9-11 > image 419 of 741; county courthouses and offices, Massachusetts. Charles Hudson, History of the Town of Lexington, Middlesex County, Massachusetts; from its First Settlement to 1868, 2 vols. (Boston: Houghton Mifflin, 1913), 1: 39-40. Hudson, History of the Town of Lexington, Middlesex County, Massachusetts, 1: 48. Middlesex County, MA: Probate File Papers, 1648-1871.Online database. AmericanAncestors.org. New England Historic Genealogical Society, 2014. (From records supplied by the Massachusetts Supreme Judicial Court Archives.) Case 15751, 1-7. Hudson, History of the Town of Lexington, Middlesex County, Massachusetts, 2: 77-78, 467-68. Thank you for this peek at the history behind a spirit lifting,heart warming local tradition. I am guessing that other traditions commemorating our clash with the British have evolved or been lost in time. I was very young so can’t be sure of the occasion but it could have been Patriots Day and part of this commemoration. Many years back, when the area was less urban and more rural and traffic wasn’t such a hazard, there was a commemorative reenactment of the ride to warn the citizens which everyone thinks of now as the ride of Paul Revere. A person was selected each year to ride a horse, racing from Boston on to Concord and Lexington and marking the beginning of mock battles and parades etc. I am wondering if it may have been a now lost part of the Battle of the Green celebrations. My uncle, John J. Campbell ( 1908-2000) was honored to make that ride and it is now part of his legacy to us. The family lived in Medford. During his stint in the Army (between WWs) he was in the Cavalry and was on the Army Performing Riders team doing tricks and so forth on horseback. I don’t know if the Army provided the rider or if he was selected as a hometown boy or what? I have no details . I am hoping someone will have knowledge of those times and be able to tell me where his commemorative ride began and ended and something of the festivities that went with it, etc. Would it have been part of the larger Boston area celebration or that of a smaller community., when did they initiate the rides and when was the last one, etc? I first moved to Lexington in 1973 and of course got up in the middle of the night to see the reenactment on the green with my children. It starts about 6AM with the church bells ringing and the men come running out of the Tavern and then the British in their brilliant “Redcoats” come marching up Mass. Ave from the direction of Boston, Cambridge and Arlington. The ride you refer to is the reenactment of the ride written of in “The Midnight Ride of Paul Revere” although it wasn’t he that made it to Lexington to warn the residents of” the British are coming, the British are coming”. It was I believe a fellow named William Dawes. It started somewhere in Boston or Cambridge after the lanterns were hung in the Old North Church one if by land and two if by sea. The reenactment of the ride I believe still goes on but in my time in Lexington it he comes riding in to town by way of Mass Ave just before the parade starts and I believe he goes on to Concord to warn them. I believe my history is correct but if you live in the area you really should go to Lexington and there are very nice volunteers who give talks on the Green and the visitors center and Historical society volunteers probably tell you more detail of how they chose the rider etc. Thanks for taking the time to reply. I envy you the family tradition of attending the reenactments. I do appreciate the additional history but… Somehow I knew I’d get the “not really Paul Revere” lecture. That’s why I only referred to it in oblique terms even tho in the past they always euphemistically credited P.R. with the ride out of tradition, if not accuracy. That was not my focus. What I was hoping for was perhaps a reference to a source telling about the history of the reenactments. What I am looking for is any clues to local sources which might identify who sponsored the community reenactments in the Past (1925-1945 perhaps), and where records of participants might be maintained. I am guessing that the most likely source would be the various local newspapers but thot I should ask. Joanne, the Lexington Historical Society may have some information on those earlier celebrations. You can contact them through their web site http://www.lexingtonhistory.org. I’m a guide at the Hancock-Clarke house, and can confirm that Paul Revere did make it to Lexington that evening, arriving at the Reverend Clarke’s home, arriving around midnight, just ahead of William Dawes. However, Revere did not make it to Concord. He was detained by a patrol of officers in Lincoln. Also, if I may offer a minor correction to the original post, the Lexington Historical Society leases Buckman Tavern from the town, though we do it for 99 years at a time!